Adam Behney, an avian researcher at Colorado Parks and Wildlife, recently completed the first phase of his research study on foraging ecology of ducks and shorebirds in the South Platte River Basin, which was partially funded by a 2016 PLJV ConocoPhillips grant. The research directly addressed information PLJV needs for biological planning and will provide more accurate energetics models to help determine habitat goals. PLJV uses energetics models for waterfowl and wetlands to estimate the amount of habitat needed to support migrating waterfowl and shorebirds. However, most of the data about calorie amount and composition in wetlands is from eastern wetlands, like in the Mississippi Valley. 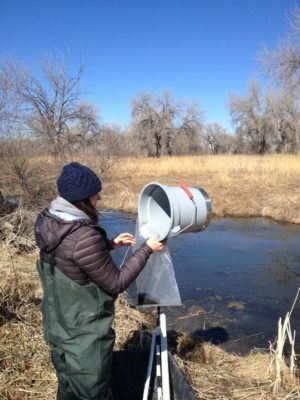 This research focused on important wetland types in Colorado and provided PLJV with calorie estimates for these wetlands (moist soil units, emergent marsh, warm water sloughs, playas, recharge ponds and reservoirs). In addition, this work looks at food availability in different seasons — something that many studies don’t do. Samples were taken in the fall before fall migration, in the winter before spring migration and after spring migration. This gives us an idea of how available food changes as birds move through during migration and the amount of loss due to decomposition during the winter. We also have an understanding of the potential food stress waterfowl and shorebirds will be under during spring migration. Photo credit: Collecting samples by Adam Behney.